For music that was created out of a hobby, I can only say that more musicians that are so-called professionals should a take a listen. 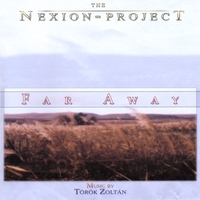 There is nothing amateurish about the album Far Away, the music of The Nexion-Project. It is even more remarkable when you consider that The Nexion- Project is the work of one man, Torok Zoltan. His contemporary works are genre-bending compositions that combine electronic, cinematic, Neo-symphonic and music bordering jazz. Yet, every track on Far Away has universal appeal. This is music for every day and every night, no matter what your mood. What has Dawn, The River and Dusk have in common? It is part of the track listing and generally, it is things you can see from Far Away. Dawn has delicate guitar, violin and cello gliding effortlessly atop a warm piano score. Like some living being, some plant of light, the dawn emerges and grows over the horizon, warming everything it her path. As petals of light unfold, we benefit from the beauty and warmth. This is a really thought provoking track and it opens the album splendidly. Up ahead we see Crossroads. The song boldly delves into the electronic side of World music. It has a strong bass line and an up-tempo, but the strings flow into every crack and crevice of your being. It is a resting point for the journey, a chance to reflect and decide. Landscape turned out to be a jazz tune complete with sax, thrumming bass and echoing piano. It is a diorama for the senses. At times it is sunny day with verdant rolling hills and at other times it is the black coolness of the night with a twinkling of stars for good measure. It is whatever your mind wants to see. In the distance is a hedge of red Roses. That is the name of the track where Nexion - Project infuses waves of joyful color in the mix. A rose is so much more than just a mere flower. It is the feel of organic silk to the touch, crimson beauty to the eye and the memory of passion to the soul. The opening strains of The River have a resonance like Tibetan bowls. It is that warm, quavering sound that gives a touch of the exotic. There is the river, dark and flowing, soft and oftentimes inviting. Do we just go with the flow? Or do we fight the current, no matter how gentle? It is all a matter of what our goals may be. The last cut, Let Us Know the Truth is one of the most interesting. There is a lot of electronics and the bass line could be from a European dance club, but then the unexpected vocal, like in an Enigma tune, catches us off guard. The music pulses and gets your head going and your body just has to follow. Perhaps the truth is Far Away. The Nexion - Project otherwise known as Torok Zoltan is a noted Hungarian composer who got his hands on a synthesizer at an early age and it sparked a quest for learning, but just a hobby. He really is a degreed cartographer, but it appears that he follows a map he created out of musical notes and synthesized melodies. I know it will lead him to a great career. His music exists for the spirit that seeks expansion, the heart that is full of emotion and the body that desires freedom. I have to say I liked every cut and the music was perfect for just getting lost in my own thoughts. Now where was I?